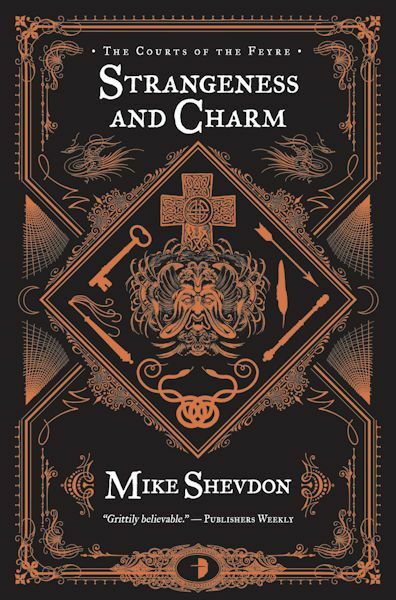 The Qwillery is delighted to have an interview today with Mike Shevdon. Mike is the author of The Courts of Feyre series, which you should run out and buy or download immediately. Strangeness and Charm, the third novel in The Courts of the Feyre series, will be published in the US and Canada on May 29, 2012. The rest of the world has to wait until June 7th. TQ: Welcome back to The Qwillery. Mike: Thank you for inviting me; it’s good to be back. Mike: Many people have writing quirks - they need a special pen, or a coffee first, or to be in a particular place, in order to write. 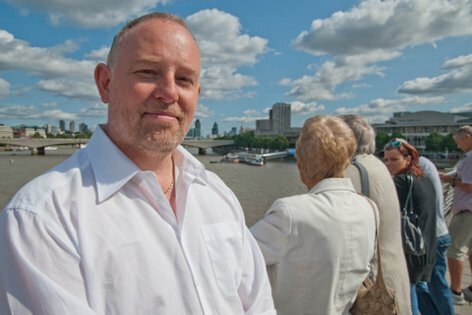 I used to work in London, and commuting in and out took about three hours every day. I also travelled internationally on business to the US, Europe and elsewhere. These are noisy disruptive places with announcements and interruptions every five minutes, but at first, this was the only time I got to write. As a consequence, I’ve written on trains, planes, in the back of cars in traffic jams. I’ve written in airport lounges, in hotel rooms when I’m jet-lagged and awake at 4am, and on sun-loungers when I’m on holiday. I’ve written in a notepad, on a phone, on a PC or a Mac, on an ancient Psion organiser. I make notes on napkins, business cards, and in desperation on my skin. Oddly, the place I find easiest to write is on trains, though I often have no memory of the journey or who I sat next to. Occasionally I have missed my stop. Mike: I’m a plotter. I’m the arch-plotter. When you’re writing a four-book series and you’re layering in plots and sub-plots and character plots and sub-character plots, you need a plan. My plans stretch across four different media, has flow-charts, mind-maps, card-indexes, outlines and timelines covering a thousand years. It’s hard to describe, but sometimes you have an entire plot in your head and you turn it - the entire thing - in your head, to view it from a different perspective. It can make your ears bleed. Mike: Continuity. I have upwards of eighty individual characters with their own idea of where they’re going and what they’re doing. Keeping track of who knows what, and their motives, what they know, and when they knew it, is challenging. Know thy people. It’s a mantra. TQ: What inspired you to write the Courts of the Feyre series? Mike: Two things. The first is the perception of people in ‘normal life’. I’ve seen people walk past the same thing for years and then, when you point it out to them they say, Wow! that’s amazing. People get absorbed into their own reality. They don’t see what’s in front of them. The second is English folklore. It’s full of stories that make you want to explore and ask questions. How does it feel? What does it mean? Where did it come from? They are the what-if questions that for me are at the heart of stories. Mike: I generally start with a question and I find a thread and I start to pull. I follow where it goes, even when it doesn’t seem relevant. I’m rarely disappointed. Of course, the Internet is wonderful, but it tends to disguise opinion as fact. It makes a great starting point to discover things, but you have to follow through and chase down the references. In the end, there’s no substitute for being there. When I was researching The Road to Bedlam I spent three days exploring the East Yorkshire Coast. My aim was to know what it smelled like, sounded like, how the people were, and how they interacted in that environment. TQ: Why did you decide to write ‘hidden world’ Urban Fantasy? Mike: Because so few people do, I guess. I found out why they don’t. It’s because maintaining a consistent reality with a changing baseline is difficult. Reality shifts and moves under you. I wrote about a little shop in the Royal Courts of Justice, just inside the door. When I wrote the book it was there, and now it’s not. Does it make it less true to say it’s there? No. The shop stays, even though it’s not real. You can’t always do that. If someone wrote about a meeting in the Twin Towers in New York and then 9/11 happened, it can’t stay. Keeping in touch with reality is hard. A hidden world is rewarding, though, because if you do it right there is this nagging thought that it could be true. It makes people look at the worlds with new vision, they lift their eyes and see. TQ: Tell us something about Strangeness and Charm (Courts of the Feyre 3) that is not in the book description. Mike: Niall wants to believe that his daughter is okay. She’s been through some stuff, but he wants to believe she came through it unscathed. In his heart he knows that’s not true. She bears the scars and he knows she’s been affected, but he wants to believe she’s okay. It’s who he is. She’s not okay, though, and neither is he. TQ: In Strangeness and Charm, who was the easiest character to write and why? Hardest and why? Mike: The easiest to write is Niall. He’s the most like me, although he isn’t me, but when I look at things and think, what would Niall do? I just know. The hardest was Alex. I’m not female, I’m not sixteen. I’ve never been female and sixteen and had that experience. When my female beta-readers came back to me and said, you write extraordinarily well as a teenage girl, I knew I had it right. TQ: Without giving anything away, what is/are your favorite scene(s) in Strangeness and Charm? Mike: What, I have to pick only one? Oh dear. But I love them all. Okay, the very last scene. It was an indulgence, a closing off of a loose thread, but it means so much more. It has a character that I would love to return to (and will, if I can) and a perfect scene. It’s whole. It’s beautiful. And it represents all of what the Courts of the Feyre is about. TQ: Which character from the three Courts of the Feyre novels has surprised you the most? Mike: Raffmir. Without a doubt. He’s a homicidal, genocidal, might-is-right unreconstructed hawk. He plays fast and loose, murders witnesses, and systematically persecutes those he doesn’t like. He’s pompous and self-centred. He’s fiercely loyal to his friends, intelligent, gifted and witty. He thinks on his feet and is a joy to write. I’d love to meet him, though on second thoughts, that might be a bad idea. TQ: The series has new covers (which means I’ll be buying the first 2 books again). Do you believe that the new covers more accurately capture the novels? Mike: Oh, that’s hard to say. 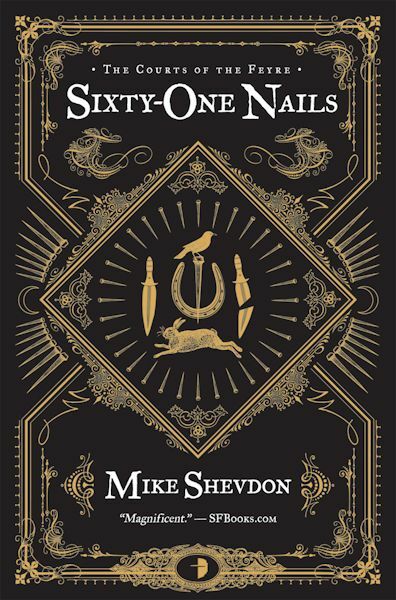 I loved the original cover to Sixty-One Nails. It’s clean and sparse with such iconic imagery. John Coulthart’s new covers, though, are beautiful. They have such detail in such exquisite rendering that they’re impossible not to love. He’s captured the iconography and the mystery of the books in the covers and I think he does them justice. If the purpose of a cover is to make you want to pick up the book, then John has succeeded. Mike: I’m writing book four at the moment - The Eighth Court - the final book in this series. That will bring together the threads of the previous three books and we will learn what’s been going on. It’s the culmination, for me, of ten years work. That will keep me busy for a while and then there will be edits and revisions and all that good stuff that gets us to a finished book. After that, I have some other projects I want to work on. I have a science fiction book I’d like to write, about water, and another book set in the modern day which is almost a ghost story but not quite. Then there’s a completely new series which we might call Attack of the Squid People for development purposes. We’re into 2015 now, is that far enough? Mike: Thank you, my pleasure. In March 2011, Mike wrote an extremely informative guest blog for The Qwillery about the word "Feyre." Rather than just link to it, I decided to include it here for your reading pleasure. I was asked by Sally (Qwill) how 'Feyre' - as in the Courts of the Feyre - was pronounced. The answer is easy; I pronounce it the same way as 'fair', but you can pronounce it any way you want. But why Feyre? Why not Fae or Fey or Faerie? That question requires a longer answer. It's been an issue of some controversy - several reviewers have commented that having the Courts of the Feyre wasn't true to mythology or consistent with other writers who wrote about faerie, fey, or fae, creatures. It seems like an obviously made up word and for some people that jars. There is even one notable rant on the subject on the web, though I suspect that is prompted by other motives related to the website owner's own work. So why invent a word when other words already exist? The idea for the Courts of the Feyre was prompted by a question. What if the creatures of English folklore really existed? A question like this prompts other questions: Why can't we see them, why don't we read about them in the newspapers? The answer to that is simple - they have magic that conceals them, but that sparks its own questions: What kind of magic? How does it work? It also spawns more subtle issues - what happens when these creatures die? Where is the evolutionary trail, the fossil record? Some authors spend a huge amount of time world-building before they begin to write their stories. I guess they need a full picture of their world before they begin, but that's not how I approached it. I began with the ideas spawned by the questions and the rest of the world is consequences. We can't see these creatures because they have magic. If they have magic, why don't they rule the world? There are too few, though they live a long time. Why are they dying out? There are a number of authors who use Celtic mythology in their stories, some in very innovative ways, and Celtic mythology has it's own stories and cycles, but that's not my background and not my heritage. I'm English - about as English as it gets. My family tree disappears into Anglo-Saxon, possibly Viking immigrants (bloody Danes, coming over here, stealing our jobs, what's the ninth century coming to?) - at least as far as anyone knows. So when I created my world I wanted an English, not a Celtic, mythos. I also wanted a modern world - if possible our world - the one where we go to work, eat burgers, have iPods and mobile phones, where there are police and CCTV. Again, it went back to a question - what if English folk-lore had a basis in truth - not the literal truth, but stories based on a reality that was only partly visible in the first place? What if the source of those stories was still there? If you read enough English folklore there are themes that emerge. Time is not constant. A man meets a group of people on the road and they invite him to a party. The party is under a hill, but he goes with them and enjoys a fine night of feasting and entertainment. The next day he emerges to discover that everyone thinks he's dead. His wife has re-married and his children don't recognise him. Years have passed. Why the fascination with children? Because they don't have many children of their own. Infertility has crept in and they are no longer able to reproduce. They breed slowly because they live a long time. That wouldn't make them infertile, though, would it? It would if they've been selectively breeding themselves. To reinforce the magic, to bring out the traits that leads to power. But if they were selectively breeding themselves, then that would imply governance, or at least a societal pressure to conform. Where would such a pressure come from? And how do you explain that these creatures are all different? There are hobs and goblins, boggarts and brownies, trolls and nixies. Surely this isn't one race of creatures, but many? What if they're all the same creature in different forms? How would they get to be different forms? A small change in DNA, a specific mutation, will result in differences in appearance. Wouldn't that even out in a population over time? It would, unless that population deliberately segmented itself based on appearance. Because the outward appearance is related to the power that goes with it. Different appearance, different abilities. Power corrupts, and absolute power corrupts absolutely, so if you had the power to change the world according to your will, wouldn't you eventually destroy yourselves? Isn't that what magic is - the power to change your world to suit yourself? But if many people have that power then surely they will come into conflict? There will be war, and that will destroy everyone. Perhaps there was war, but so long ago that no-one remembers. They only remember what came from it, a division, a mechanism for peace and if not harmony, then separation. A population divided on their ability to manifest particular sorts of power, bent on strengthening and fostering that power, to the exclusion of all else. Seven Courts, established to provide peace and justice, and to prevent war. For the name of these courts I looked first at Fey and Fae, but these words have connotations of flightiness and unreliability. My courts were about justice and judgement, and they made life and death decisions, so fae wasn't quite the right word. The idea of justice and judgement led to the phrase, The Fair Folk, a term used to describe faerie creatures, but the Courts of the Fair didn't quite work for my purposes, because they weren't always fair. Sometimes they were pragmatically unfair, even brutally so. So I went back to the Middle English word 'fayerye', derived from the Old French 'faerie'. Not a pure French word, but one that was notably English in style and spelling. After all, no English dictionary existed until A Table Alphabeticall in 1604, produced by Robert Cawdrey: "A table alphabeticall conteyning and teaching the true writing, and vnderstanding of hard vsuall English wordes, borrowed from the Hebrew, Greeke, Latine, or French, &c.
From 'feyerye' I derive the Courts of the Feyre, a very English interpretation of mythical folklore in a modern setting. It's anachronistic, in the way that a creature that lives for a very long time would be. In this world the themes from folklore are all there; lost children, deals and bargains, hidden worlds and lost time, but these are interpreted against a modern backdrop where ancient history is just below the surface and secrets and mysteries are hidden under our noses. And for those who feel I have taken a liberty with the English language by creating a new word for creatures that have been part of English folklore for a very long time, I would ask your indulgence and for you to bear in mind that for the majority of that time, the spelling of words has been somewhat variable, and my spelling may not be as original as it seems. There is a secret war raging beneath the streets of London. A dark magic will be unleashed by the Untained… Unless a new hero can be found. Neverwhere‘s faster, smarter brother has arrived. The immense SIXTY-ONE NAILS follows Niall Petersen, from a suspected heart attack on the London Underground, into the hidden world of the Feyre, an uncanny place of legend that lurks just beyond the surface of everyday life. The Untainted, the darkest of the Seven Courts, have made their play for power, and unless Niall can recreate the ritual of the Sixty-One Nails, their dark dominion will enslave all of the Feyre, and all of humankind too. 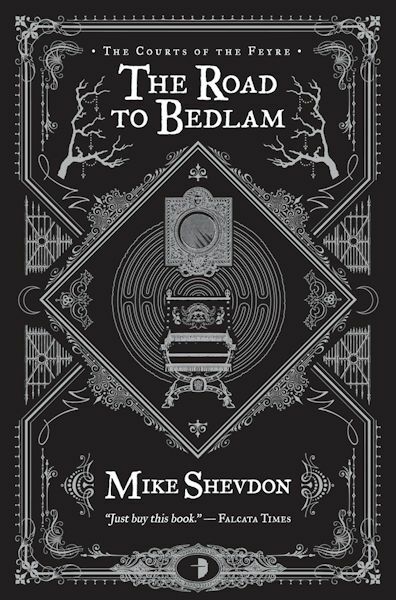 Mike Shevdon was born in Yorkshire, grew up in Oxfordshire and now lives in Bedfordshire, so no-one can say he hasn’t travelled. An avid reader of fantasy since his early teens, he has a bulging bookshelf going back more than thirty years. His love of fantasy started with Edgar Rice Burroughs and C S Lewis and expanded rapidly, spilling over into SF, crime fiction (usually mystery in the US), thrillers, the back of cereal packets, instruction manuals and anything else with words on it. He is a keen cook (his wife would use the word ‘messy’ but that’s another story) and is the inventor of Squeaky Cheese Curry. He particularly loves food from South East Asia and is on a life-long quest to create the perfect satay sauce. His favourite books include Barabara Hambly’s Darwath Trilogy, The Master and Margarita by Mikhail Bulgakov and any of John Le Carre’s George Smiley books. He is a big fan of Robert Crais and the Elvis Cole series and loves all the Janet Evanovich, Stephanie Plum novels. He believes Sir Terry Pratchet’s knighthood is richly deserved. Mike draws his inspiration from the richness of English folklore and from the history and rituals of the UK. The Courts of the Feyre is a series that follows the adventures of Niall and Blackbird as Niall discovers a world of dark magic and strange creatures hidden in plain sight. 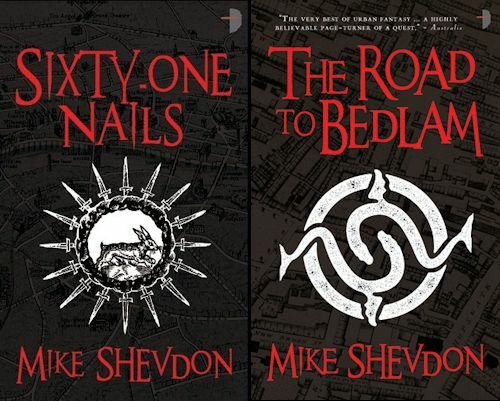 The first two books in the series, Sixty-One Nails and The Road to Bedlam are available now worldwide. Both books are complete stories in themselves and may be read independently, though they are probably best enjoyed in sequence. There are two more books scheduled – Strangeness & Charm in summer 2012 and The Eighth Court in 2013. What: One commenter will win a signed ARC of Strangeness and Charm (The Courts of the Feyre 3) from Mike! Who and When: The contest is open to all humans on the planet earth with a mailing address. Contest ends at 11:59pm US Eastern Time on Saturday, June 2, 2012. Void where prohibited by law. No purchase necessary. You must be 18 years old or older to enter. I like the new covers. I think it is a cool idea to go gold, silver, and bronze. Just in case you didn't know what the first book was, you would just have to follow the idea of first, second, and third place winners. I like the new covers, too. I see a cover as a clue to what the book is all about. I've added this series to my must have list. I like the newer covers much better as they seem to be more "Historical and English". Great new art work. Do you think it is okay if I enter even though I have the same giveaway going? I'm a fan too, not just an interviewer, and you did a great job with yours. I thought Mike and I covered it all, but you brought some new questions I really enjoyed. My favorite scene was also the ending, with Avenger type comparisons. I love the new covers. Great play on Mike's strength of using clues and relics to drive the plot. I've tweeted, facebooked, linked this giveaway in mine (AudioTim 36) and followed. Keep up the good work! I love the new covers. I discovered these books awhile back and they are fabulous! I think I like the new covers better. Not that there's anything aesthetically wrong with the old ones, but I think that their being mostly black coupled with the font makes them look like horror novels. I like the covers but I did not see the original. The new ones are very appealing. I think I like the new covers better. Not that there's anything aesthetically wrong with the old ones. It's just that to me, their being mostly black coupled with the font makes them look like horror novels. The new covers are more intricate & intriguing. Still, a signed copy wouldn't be a misfit on my shelves either. the new covers are GREAT!! they really drew me in!!!! I like the covers. They're very interesting. I like the new covers, bu I also like the old ones better. In comparison, the old ones look a lot cleaner. I'm never a fan of covers changing in the middle of a series because I like for them to match on my bookshelf. But I like the new covers for this series. The little details make the covers. Every time I look, I notice a new detail.